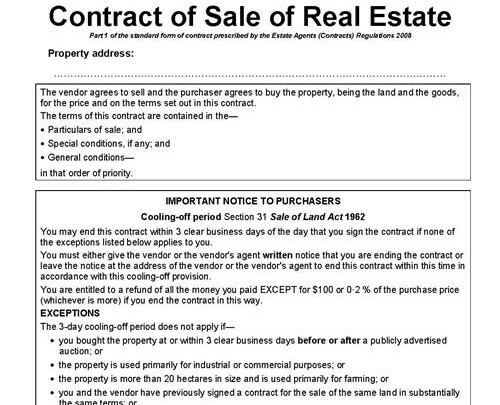 Any person may use the Standard Contract of Sale of Real Estate document, including estate agents, lawyers, conveyancers and individual consumers, provided that it is used in accordance with the Guidelines For Copying and Use of the Standard Contract of Sale of Real Estate (see below). This contract document follows the design of the standard form Contract of Sale of Real Estate as it appears in the Estate Agents (Contracts) Regulations 2008 amended as at 1 October, 2014. However, it has also borrowed from the formatting of its predecessors in order to give a more familiar look and feel. Page 1 requires the address of the property to be entered where indicated. Nothing more is entered on this page. Page 2 is the signature page. The purchaser(s) sign to confirm the formal offer, and the number of days for which the offer remains open for acceptance by the vendor is entered in the brackets below the purchaser(s) signature block. Note that if no figure is entered between the brackets the offer expires automatically after 3 business days. These last 3 pages of the document contain the Particulars of Sale, including details of any Special Conditions. These details are ordinarily completed by the purchaser or the purchaser’s legal representative. Pages 6 to 12 of the document require no writing whatsoever, as they contain the General Conditions as required by the Estate Agents (Contracts) Regulations 2008. All variable information is confined to Pages 1 to 5 of the document. Estate agents who are asked by purchasers as to the meaning of the General Conditions can simply refer the purchaser to this notice. In this way the estate agent is able to save time,avoid a ‘conflict of interests’ situation, and know that the purchaser will have access to a document that will provide information, without causing confusion or misunderstandings. (See our document “How To Understand the New Standard Form Real Estate Contract“. The document must not be sold. A breach of these guidelines will constitute a breach of copyright.